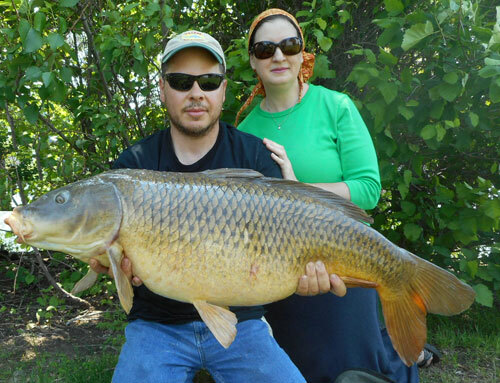 Guided carp fishing lessons with Montreal's carp guide, Freshwater Phil. Learn how to fish, hook, fight and land big carp. Technique: Still fishing from shore. Best time: May thru October. All gear, tackle and bait provided. Can accommodate large groups up to 10-12 people. Transport from Montreal (Metro station) for groups of 3 or less people (if required). Daily rate: $350 for up to 4 adults, $50 per additional person (kids under 12 free). Tips welcome. Contact me about a guided fishing trip by clicking here. 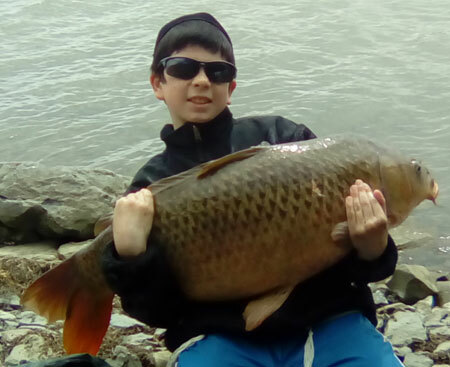 Fishing for big carp is one of my favorite hobbies. Over the years, I've caught hundreds of carp using various techniques. A number of years ago, I decided to start sharing my knowledge and techniques with other anglers interested in targeting carp. Many people have pre-conceived notions about carp being a trash fish, not worth bothering with. I can't begin to tell you how wrong they are. For starters, a "small" carp will already be bigger than most bass, pike, walleye or trout that your average fisherman will hook in a lifetime. Next, your average carp will be in the 15 lbs range, with a very good chance at landing a 20 lbs+ carp during any given outing. Add the sheer excitement of a line going off during the initial run, followed by an explosive fight not rivalled by most freshwater fish species, and you have a recipe for some great fishing. When you hire me as your guide, I will show you what you need to know to get started on your own if you choose to do so. I provide all gear and tackle, and will make enough of my own bait to use during our outing. I use lighter tackle than most conventional carpers, to add to the sensation of fighting big fish on lighter tackle. Putting my customers onto good carp fishing is a passion, I do my best to ensure your satisfaction on every outing. I take personal pride in every fish landed, and look forward to every outing as a new adventure. Head out to the shores of the world famous St. Lawrence River, one of the best carp fishing waterways areas in Canada & North America. Fish reaching over 30 LBS, occasional 40 LB carps are caught every year. Learn how to target, hook, fight and land these big suckers. If you haven't tried fishing for carp or have never had the chance to fight one yet, you owe it to yourself to give it a shot. Carp fishing is fun for the entire family, bring along your little ones for a day of fun. Let me show you how it's done, chances are you'll be hooked for life! Check out my carp fishing picture gallery by clicking here.